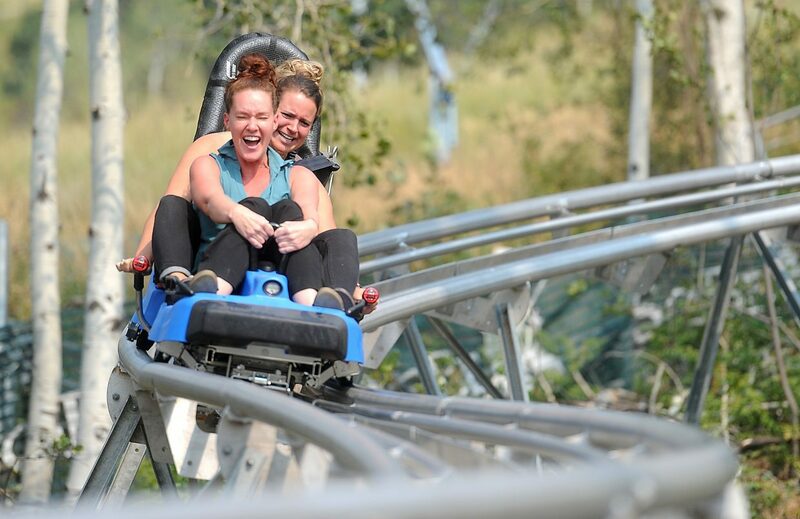 Laura Graves, front, and Sina Good brace as they go into another turn on the new Outlaw Mountain Coaster at Steamboat Ski Area. STEAMBOAT SPRINGS — Steamboat Ski Area is looking into what may have caused a collision last month on their new mountain coaster. Ski area spokeswoman Loryn Kasten confirmed a collision took place Sept. 21 when the ski area was offering free rides as part of a community appreciation day. Kasten said one cart hit another when they entered the end of the ride. There were four people on the carts, and Kasten said at some point they sought medical attention. “We are working with the individuals as well as looking into what might have caused this isolated incident,” Kasten said. Kasten said it appeared the coaster sleds feature intelligent distance control, which brakes the sleds to keep them from getting too close to another sled. They believe the braking system failed on one of the sleds, and that sled has been removed from the ride, Kasten said. The coaster, which has 6,280 feet of track and is the longest one built in North America, opened Sept. 7. Riders are pulled up the tracks from the base of the ski area to Christy Peak. From there, gravity takes them down the track, and riders have to push on handles to disengage the brakes. Similar coasters are being constructed at ski areas throughout the country as they compete to attract summer visitors. The sleds in Steamboat top out at speeds of 25 mph. Despite the automatic brakes, Kasten said riders need to be responsible for their speed. The coaster was built by Wiegand Sports USA. After construction, Kasten said the coaster was tested for a week, and Wiegand performed inspections. The coaster will also be inspected annually. Mountain coasters are regulated by the Colorado Division of Oil and Public Safety.